A free printable! Think outside the box, busy lady. This to-do list helps to keep your projects and ideas organized in a non-linear fashion. The circles keep your ideas and priorities together, without limiting you to a linear format. I made this task list as a way to keep my creative thoughts organized. I keep it next to my computer, so that if I have a new idea in the middle of a different project, I can jot it down and revisit the idea later. The little boxes help to note which projects need to be done first and also work as check boxes when the task is complete. This to-do list works great for career women, stay at home moms, and work at home moms, to keep tasks organized. Lady's Multi-Tasking To-Do List is free here for download. 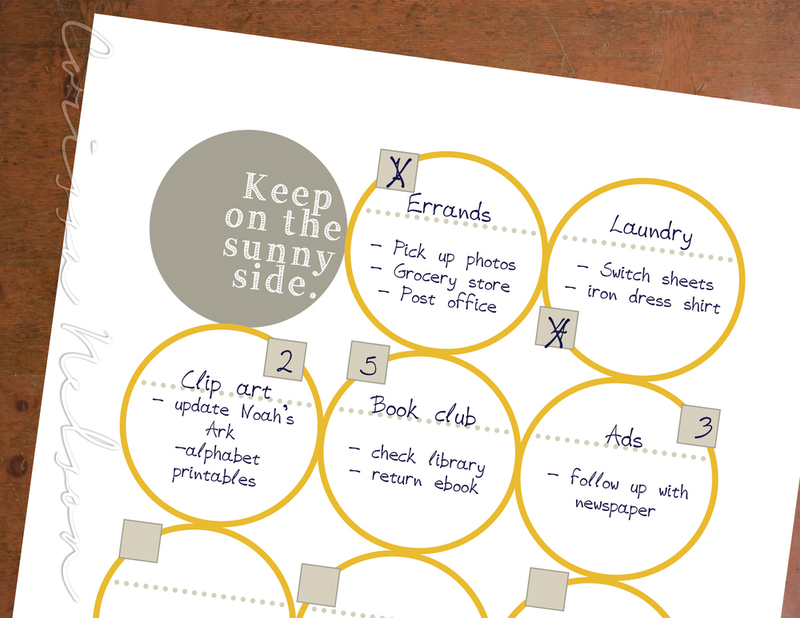 I also have The Sunny Lady's Multi-Tasking To-Do List available in my shop. Thank you to all of the sweet ladies that have encouraged me in my design work! See also Creatively Wasting Time and Interviews: Ideas from Women Who Find Time for Creativity.